The Apollo Lunar Surface Experiments Package (ALSEP) experiments on the Moon’s surface returned a wide variety of scientific data that is essential to further exploration and characterization of the lunar surface. This focus group has found data that are being brought to light for the first time in 4 decades, and which will greatly enhance the scientific archives for all lunar scientists. Understanding the dust and plasma environment on and near the surface of the Moon will allow us to better define requirements for surface operations, dust mitigation and radiation protection. The South Pole-Aitken (SPA) Basin is the largest known impact basin in the Solar System. 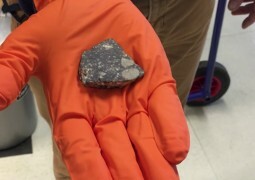 With a diameter of 2500 km, SPA provides great scientific potential for extracting native lunar mantle material and determining bulk lunar composition. The surfaces of the Moon, Mars, Phobos/Deimos, and asteroids have recorded and preserved the impact history of the inner Solar System since their formation. Studies of the impact record on planetary bodies can give valuable insights into the ultimate evolution of the Solar System. Continued exploration and scientific research produces emerging markets and new opportunities to expand human commerce to the Moon. Efforts spawned from the Google Lunar X-Prize offer significant new opportunities for the lunar science community. Water and other volatile constituents in and on the Moon and asteroids are resources for both science and exploration. They contain scientific records of processes and sources of volatiles in the distant past. They also are useful for producing propellant and life support for exploration initiatives. This focus groups aims to support discussion on cutting edge science capability, through expanding the successful CubeSat model, developing core technologies through the Office of the Chief Technologist, and promoting the further development of ‘microsized’ instruments as well as instrumentation for larger mission concepts. We also aim to support essential instrument development and determining physical and cost limitations for broad categories of instrumentation. Potential mission and launch opportunities over the next several years is also discussed. Terrestrial analog field studies offer the unique opportunity to prepare for robotic and human planetary missions. Analogs provide the opportunity to conduct studies and tests related to science, mission operations, and technology in a relevant environment at relatively low cost and risk. The SSERVI Analogs Focus Group aims to bring together members of the community to discuss and review various aspects of fieldwork including, but not limited to, field sites, deployment logistics, field instrumentation, concepts of operations, software and hardware testing, etc. New research suggests liquid water can survive catastrophic impacts and could be abundant on exoplanets, making it more likely that life exists beyond our Solar System.